Fain is a small ruin located slightly north of New Sheoth containing Heretics. It contains only one zone, Fain. 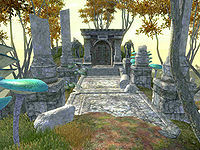 Fain is inhabited by a group of Heretics who worship an unholy being known as Gyub. The Heretics sacrifice "volunteers" to Gyub by dangling them over the Pit of Fain, reciting a prayer to Gyub, and dropping them into the Pit to their deaths. 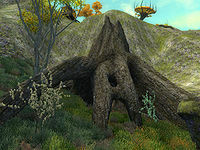 This ruin contains 61 Flame Stalk plants, 5 Screaming Maw plants, and 10 Root Stalk plants. Fain's pit contains the largest drop in the game, as the fall is greater than jumping off Dive Rock or Mount Sheogorath. For more information on the Heretical sacrifices in Fain, see the Lore Article. This location's map marker (M on map) is named Fain. The entrance door is SE of the marker, 60 feet away. Upon entering from door C, you will arrive in a large room with four enemies, including a boss-level Heretic (A), so try to use sneak to avoid facing all at once. 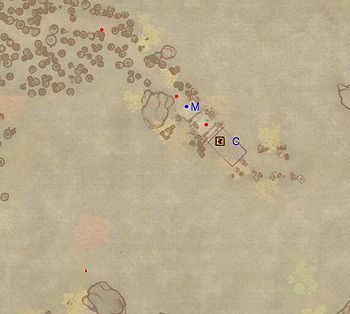 In the southwestern corner are three bedrolls (b), a full set of novice alchemical equipment (E), various ingredients and a scroll shedding some light on this ruin. Loot the boss chest at B and head to the central area. 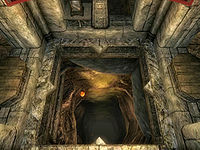 Open the glass case and retrieve Gyub, Lord of the Pit before pressing the push button nearby and opening the trapped floor at F.
After what seems like an endless fall, you will drop into a large water pool with three enemies and the body of a less fortunate "volunteer" (K). Your objective is to reach door D, leading outside, so head east. Avoid the root spikes at I, loot the amber limb at H and open the root door at J. In the next room is a boss chest (B) and an amber stump (H), guarded by three enemies, including a boss-level Scalon. Make sure to loop around the next intersection to loot both hollowed stumps and exit to find yourself at the foot of the mountain, near the sea. 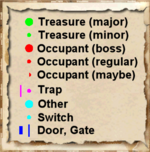 A Cave In trap was supposed to make exploration harder, specifically a few feet north of the pit. Unfortunately, the trap has no area-defined activator and will never trigger.